After a long but fun year of planning, designing, dreaming and building we are finally proud to present the fruits of our labor! 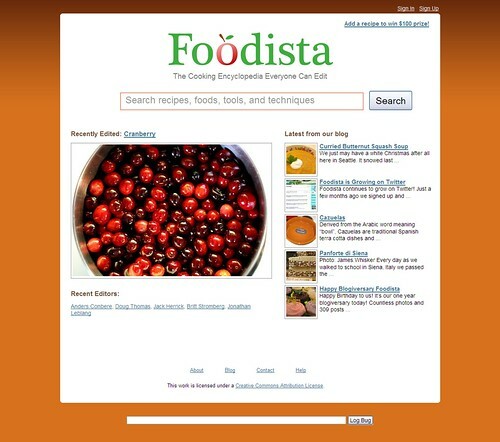 Foodista.com - The Online Cooking Encyclopedia Everyone Can Edit. Foodista is a place where it's easy to learn and share about cooking. We've organized cooking information into four basic elements that all interlink: Food, Recipes, Kitchen Tools, and Cooking Techniques. We also emphasize the beauty of cooking with big, beautiful photos of food from Flickr Creative Commons, as well as from our users. We believe in quality over quantity, so we created a place for people who are excited about food to share their knowledge with the world. Our system lets anyone edit the site to make it better and it instantly publishes, like Wikipedia.org. Two heads are better than one - and 500 is even better! That's the beauty of collaborative editing. For you food bloggers we've developed innovative technology for connecting cooking information across websites. These links help you build traffic to your blog and improve search engine rankings. Future widgets will allow you to include whole recipes from the Foodista database for free. How do you like them apples! On the more technical side, we leverage open source software, cloud computing resources, and the wisdom of the crowds to rapidly develop cooking software and content. It's important to us to be as open as possible and to share with the world what we are building. So we hope you enjoy the site! There's a lot more that's still cooking, and we look forward to sharing it all with you. Congrats! Heard about you from A.P. Is there a way to add videos to the site? I'm the host of the Seattle-based web cooking show, Cookus Interruptus (www.cookusinterruptus.com). We'd love to add videos or have you review our site on your blog. Yeah Foodista! Yeah Barnaby, Sheri and Colin. Wishing you great success and happiness. Congrats Barnaby - Fantastic to see a CC-BY licensed food site. It looks great! Congrats! And nice article in today's Seattle P-I. Congratulations! Never enough food sites (can't be. I still find time to sleep). I'll enjoy following the evolution. Remember, eating out isn't a luxury, it's your duty! I love that you have taken the open source path in creating not just a great website, but a community, including valuable features for other food blogs/sites. That's the spirit. Congratulations on your fabulous endeavor. You did it, and what a special day! Good luck, from your biggest fan. Thanks, Cynthia! Video is definitely in the works. We will announce the feature once it goes live. Date TBD. Congrats Barnaby and Sheri on the launch.